Congress of South African Students COSAS. 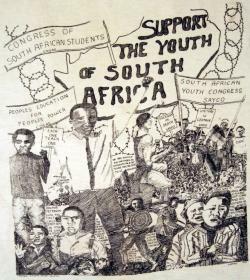 South African Youth Congress SAYCO. Peoples Education for Peoples Power COSAS. Eact one teach one COSAS. Free compulsory education. Freedom or Death SAYCO, Victory is Certain SAYCO. We are fighting for our rights as students - the right to live, and the right to be educated. 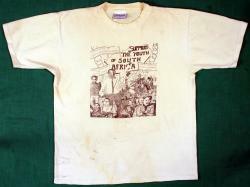 Hector Peterson was the first child shot dead in 1976. He was 19 years old. In 1996, one of four detained by South African policy was a member of COSAS. I have seen boys fighting police with stones and empty tin. Free our leaders! Free all political prisoners. There was a loud voice calling out - come and see outside in the streets the children are dying. 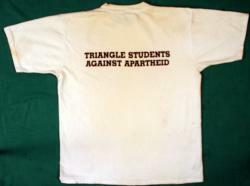 Triangle Students Against Apartheid.